On the edge of Peshawer, capital of the North West Frontier Province in Pakistan, lies a sea of white tents that is home to thousands of refugees who have been internally displaced as the Pakistani military carries out operations against so called terrorists in Bajour Agency in the region. Since the summer, Pakistan has been waging a war against its own people as it collaborates with the American military. American attacks have targeted so-called terrorists on Pakistani soil, as it expands its field of operation from Afghanistan to the border regions of Pakistan. According to the UN 190,000 people have been displaced as a result of the fighting. 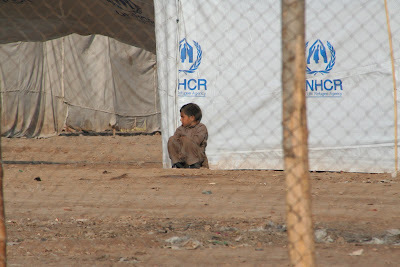 The site of the UNHCR refugee camp was previously occupied by Afghan refugees fleeing the NATO bombing of Afghanistan. The Afghan refugees have since moved on, spreading throughout Pakistan and the rest of the world, some have even returned to their homes in Afghanistan. The people who reside here now are Pakistani citizens. The tribal areas have been the site of fierce fighting between the Pakistani army and so-called Islamists since former President Musharraf signed up to Washington’s agenda in the region to root out Taliban support and stop fighters crossing the border into Afghanistan and mounting guerrilla attacks on NATO forces. The children that play in this maze of tents do not have adequate clothing for the harsh winter weather. Their faces are dirty with the brown dust that seems to permeate everything, as it is kicked up by donkey carts passing by. There are no toys, so the children play with anything they can get their hands on. Some of them use as wooden cart to pass the time, pushing it down a dirt road that separates the tents. Other children help with their family’s chores, washing dishes and carrying water. Still others can be seen collecting rubbish that they will use to earn money. A metal mesh wire fence surrounds the camp, but sometimes the entrances are too far for the children to walk to, so they make holes in it, crawling through to gain access. There is a cricket match taking place just outside the camp between children from the camp. Rocks are piled up as improvised wickets while the metal wire fence serves as the boundary. The game provides a distraction from the harsh reality of life in the refugee camp. Residents of the camp voice their objections with the US and Pakistani government policy of bombing targets in the region. Ibrahim Khan says “The only people that were targeted by the military were civilians, women and children. We did not even see who was bombing us. They bombed us from the sky. I did not see any terrorists. Our homes were destroyed as we fled, we left everything, and now our children do not have adequate education and we have been left with no livelihood.” The people’s concerns here are for their children, “We want our children to gain an education. It will take 50 years before the psychological affects of our displacement are removed from these children’s minds. We have no grievances, grudges or problems with anyone, we are a peaceful people. We want to be able to live our lives. We are Muslims, terrorism is against our religion. This is our message to the Pakistani government and the International community. We want to go home. Stop this war that you have started. We are not terrorists!” exclaims Ibrahim. Abdul Wali, whose two month old son was born in the camp, speaks of the difficulties he faces living in the camp “We are coping, but it is bitterly cold. The UN is helping us but it is not sufficient for our needs.” As he speaks, his voice carries a tone of resignation to his fate in the camp. 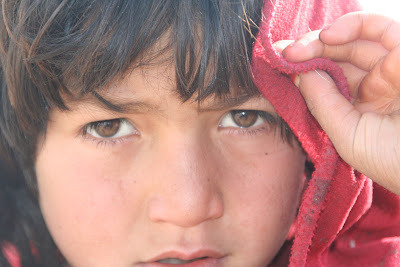 A little girl wanders the camp attempting to hide her face with her red scarf. No sooner do I take a picture of her, she disappears into the maze of tents. The other children told me the shy girl’s name was Fatima. 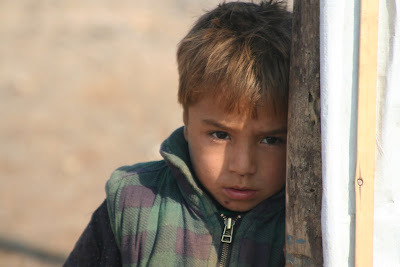 Samiullah, a boy no more than four years of age, stands languid, his head leaning against a wooden pole with a look of dejection on his face. The trauma of the flight from his home to brave the bitter winter cold of the camp is evident in his eyes. An entire generation of children have been traumatised by a conflict they know nothing about, took no part in, just collateral damage reduced to statistics for aid agencies to deal with. These are the victims of the so called war on terror. Caught between the Pakistani and American military and the so-called militants, the civilians live with the consequences, forced to leave their homes to become refugees in their own country. In Pakistani-administered Kashmir this small refugee camp is home to some 600 people who have fled Indian-administered Kashmir, 16km from the line of control. This is the line of the world’s most militarised zone. Since the Mumbai attacks and continued Indian allegations of Pakistani involvement tensions are once again forcing people to fortify their bunkers as they brace themselves for a potential confrontation. Kashmir has been a disputed territory since both Pakistan and India’s independence in 1947. The two countries have fought three wars over the region. The green metal rope bridge shakes as the car mounts. The bridge is what separates Pakistan and Pakistani-administered Azad Kashmir. One vehicle at a time, some passengers walk across the shaky structure as the collective weight of the passengers and vehicle may be too much for the bridge. Down below flows the dark and murky Jelum river. We enter Azad Kashmir and head towards Kotli district an area close to the line of control. The road twists precariously and snakes its way up, climbing steep gradients and slopes around the mountains of Kashmir. Numerous pot holes marks the tarmac. Clumps of green trees and bushes peer over the side of the narrow road, grey igneous rocks lie at the sides. The car shakes and jolts around, making its participants look like dolls, with their heads wobbling as their hands clinch tightly to the handles inside. One wrong move here and it is a sheer drop down the mountain – there are no safety barriers. It is therefore not surprising to hear every now and then the grim reports of vehicles going down in this tortuous terrain often without survivors. Kashmir is a beautiful mountainous and green region, scenic, with its amazing views and fresh air. As we pass through villages and towns on our way to the refugee camp we can see evidence of the wealth earned in Britain spent on development of the area from money sent in by Kashmiri families in Britain, home of the world’s largest Kashmiri Diaspora. Large mansions, with a clash of colours – red, green, and brightly painted white is the common design in this region. Huge pillars holding up the three-storey homes, with four-wheel-drive SUVs parked in the driveways. As we dismount our vehicle, which is now covered in thick dust, the number plate barely readable, we walk the rest of the way to the refugee camp. After traversing mountain paths, and jumping over rocks while taking in the scenery, we are stunned to see the lLine of control which the locals call the Line of Divide that separates the people of Kashmir is visible from here. My guide points to a mountain top in the distance. “There it is” he says confidently. And then he points to a green hillside within a stone’s throw of us, and adds “Shells land there when India fires its guns”. With an uneasy feeling, we head extremely close to the LOC that separates two nuclear armed nations and what remains a volatile flashpoint. Over the years the tents in the refugee camp have been replaced by small houses and even a mosque and a small State run school teaching children up to the age of ten. These children play in the narrow alleys that separate their homes in what looks like a labyrinth of narrow passages. 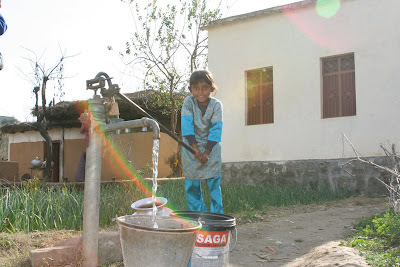 A little girl works the water pump trying to fill an old metal bucket. Her clothes are scruffy and face dirty from the dust. As we settle in we begin to talk with some of the residents here who fled Indian administered Kashmir. I asked many of the refugees if they wanted to return, and without exception they they said “If Kashmir (Indian administered) becomes azad (free) tomorrow, we shall return”. Peering through his metal spectacles, sixty year old Navi Baksh, is eager to share his story. A story that rings a familiar bell with the others heard in the camp. “We ran for our lives across these tough and forested mountains under the cover of darkness with my wife and my children” Navi says wearily. “It was a difficult and dangerous journey but we had no option, the Indian army gave us no choice, and they made life unbearable for us”. “We left with nothing but the clothes on our backs”. “The Indian army used to come into our homes and force our women to undress, saying they were helping militants and could be carrying bombs! In our own homes?” he questions. “We were helpless. The Indian army are the ones with the power. We took our respect, dignity and honour and fled, we could not live under such rule or be subject to humiliation and oppression”. The Pakistani government has provided some help for these people. Vehicles were provided for refugees to bring them to the camp. Small pieces of land were allocated for each family so that they might pitch up a tent. Each family receives 1000 rupees a month, approximately ten pounds. People told me that they are in debt, and it has been four months since the have received anything from the Pakistani government. There are thousands of refugees scattered throughout this region, victims of the conflict in Kashmir. These people are far away from the politics of Islamabad and New Delhi, even further away from Mumbai. If there is a war between the two nuclear-armed nations, it is people like those of Kashmir that will be the victims, long forgotten by the world and international community. Munshi hopes to be reunited with his son one day and return to his home. “Azadi” he says, freedom, one day.